We have such a love/kind-of-hate relationship. Nowadays, I am also loving that it’s time to start some of my planting in the garden! However, there is the major pain that spring brings me every year without fail—allergies. For those of you that do not live in Ohio valley, let me tell you, it can be hell on the sinuses! Now couple that with poor air quality and you have yourself a perfect storm of sneezy, itchy-eye, runny-nose misery. The good often outweighs the bad, but man, it would be so nice not to have to deal with it all for months at a time. With that said, the harvest of spring here in Kentucky isn’t a long list, but asparagus is on it! I really like asparagus and do not find that I use it in my cooking very often. This challenge was the perfect way for me to get the wheels turning on how I can change that! 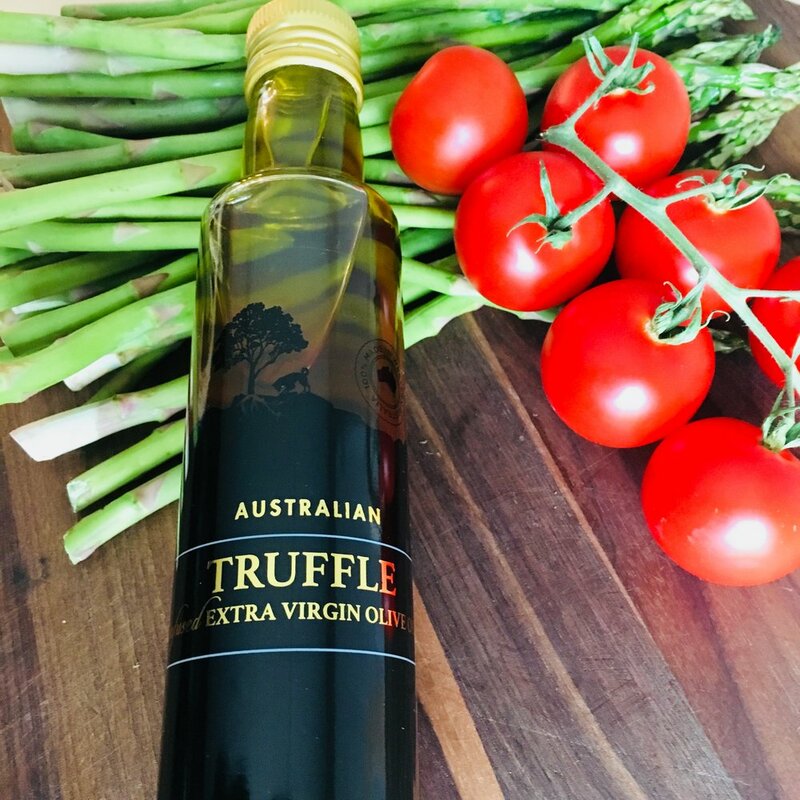 Now, I happened to be out doing a little Easter shopping the other day and came across a great deal on a bottle of truffle-infused oil! Oh man, truffle is so my jam! I could probably eat something I hate as long as it’s covered in truffle oil. With that in mind, I started thinking about how the most simple things in cooking often turn out to be the best! And so I decided on roasted asparagus and tomatoes drizzled in truffle oil. This may not be the most shocking dish, but it’s simply delicious. The remix part of this is that truffle oil wasn’t available for vintage recipes. At least, not to most home cooks, anyway. This is a new twist on an oldie-but-goodie! Serve it at a dinner party and people will think it’s super fancy. I believe it’s also just a nice change of pace, which is what I was going for anyway. Preheat the oven and a baking sheet to 400°F. Cut the woody ends of the asparagus off and halve or quarter the tomatoes, depending on the size you’re using (I used larger cocktail tomatoes, so I quartered them). Remove the pan from oven and add 2 teaspoons of the grapeseed oil. Using tongs, toss the asparagus in the oil to coat, and then sprinkle with salt and pepper. 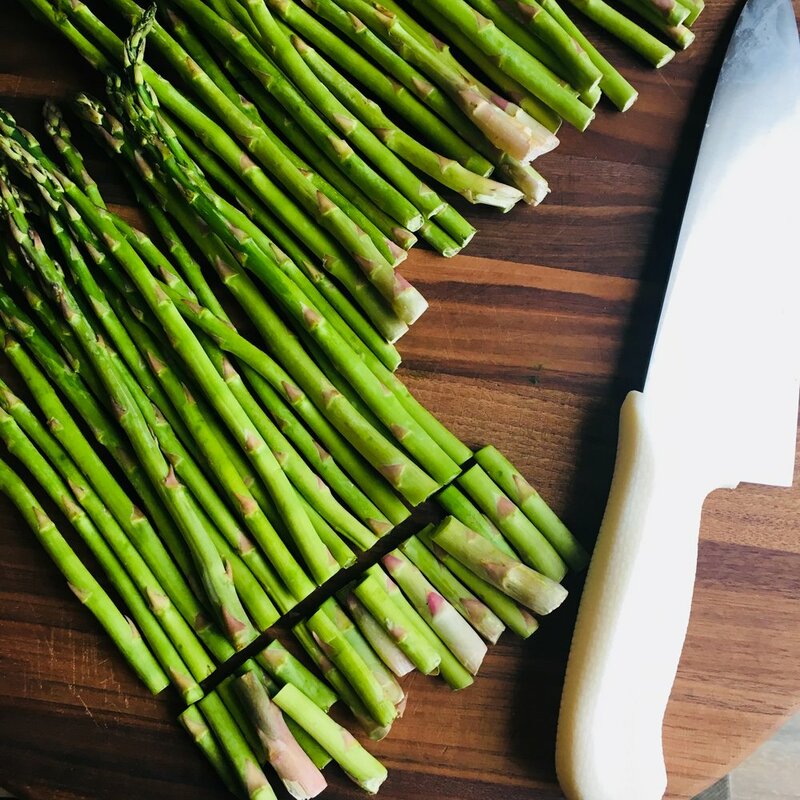 Return the pan to the oven and roast the asparagus for 10 minutes. While the asparagus is roasting, gently toss the cut tomatoes in the remaining oil, then sprinkle with salt and pepper. Add the tomatoes to the baking sheet with the asparagus and continue cooking—another 5 to 7 minutes. Allow the vegetables to cool slightly—about 5 minutes—before drizzling with truffle oil. Serve with a lemon wedge for added flavor and brightness.